When it comes to building your foundations, soil type is really important as it will inform your choice of foundation system. Failure to understand the type of soil on your site or choosing the wrong foundation system could prove very costly. Here we break down the properties of the soil types you might encounter on your site and help you decide which foundation system is most suitable. For a how-to guide on getting started with your foundations, check out our Beginner’s Guide. These rocks have a high bearing capacity. The rock may simply need to be stripped back and levelled off to build from. Rock can be impervious, so topsoil is likely to require drainage as it is not possible to build soakaways to dispose of rainwater or surface water. Off-mains drainage options will also be very limited. Providing the chalk is not too soft, widths of 450mm for low-rise buildings are generally acceptable. The depth of the foundation must be below any frost action (700mm). If the chalk is soft it will need to be excavated until firm chalk is reached. Chalk soils can be prone to erosion so be wary of hollows or caves. Dry compact gravel, or gravel and sand subsoils are usually adequate for strip foundations. Generally a depth of 700mm is acceptable, as long as the ground has adequate bearing capacity. If the water table is high (i.e. the gravel is submerged), the bearing capacity is halved, so it’s important to keep the foundations as high as possible. 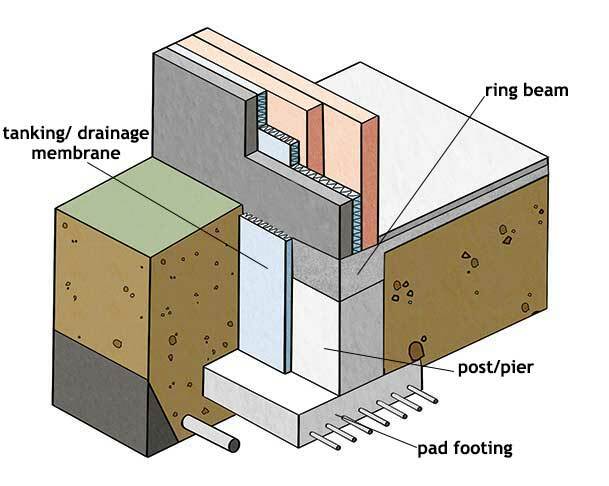 A shallow, reinforced, wide strip foundation may be suitable. 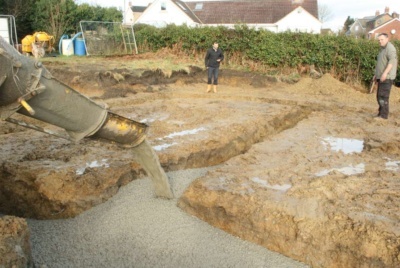 Sand holds together reasonably well when damp, compacted and uniform, but trenches may collapse and so sheet piling is often used to retain the ground in trenches until the concrete is poured. The first 900-1,200mm layer of clay is subject to movement due to expansion and shrinkage depending on moisture content, so it is generally necessary to excavate foundations to a depth where the moisture content of the clay remains stable. British Standard 8004 recommends a minimum depth of 1m for foundations But if there are, or were, trees nearby, depths of up to 3m may be necessary. In clay, prior to concreting the foundations, the trench is often protected from heave by lining it with a compressible layer (e.g. Clayboard). A traditional strip foundation is sometimes acceptable but it is important not to overdig as this may increase the stress on the softer clay beneath. 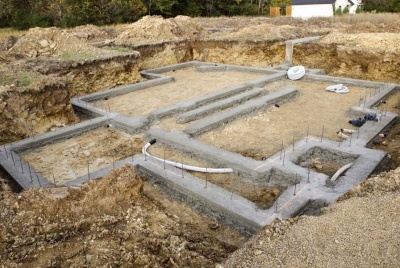 A common solution is to dig wide strip foundations with steel reinforcement — however an engineered foundation may be necessary. Peat and loose waterlogged sand are very poor subsoils. If the peat can be stripped back to find suitable load-bearing ground of at least 1.5m depth, strip foundations may be suitable. A reinforced raft foundation will likely be required. Where ground has previously been excavated and filled, it is generally necessary to dig down to a level beneath the area of the fill. Sloping sites require stepped foundations. Guidelines are given in the Building Regulations. If you don’t already know the soil type of your plot, a good starting point is to call your local authority Building Control department. They can give you an idea of the typical soil type in the area you are building, and the sort of foundation that is appropriate. 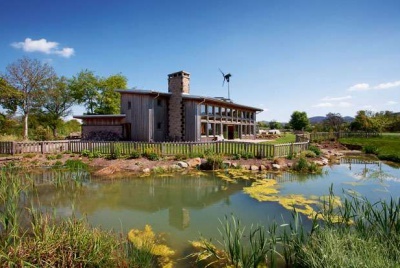 Most local authorities produce a fact sheet on typical foundation solutions for different soil types commonly found in the area. Another useful source of information is the Building Regulations Approved Document A: 2004 which lists seven types of soil plus subsoil conditions and practical field tests to help you identify soil type. What Foundation Systems are Available? A continuous strip of concrete supporting load-bearing walls. For a single storey building strip foundations will typically be 450mm wide and at least 200mm deep, and for two storeys 600mm wide and 200mm deep. Deep Strip Foundations: Where strip foundations need to be at a lower level to reach soil with suitable bearing capacity, a wider, deeper trench can be dug to work in, and the strip foundations dug and poured at a lower level. Walls are then built up to ground level in masonry. Wide Strip Foundations: Where the soil is soft or of a low load-bearing capacity, wide strip foundations can be used to spread the load over a larger area, reinforced with steel so that the loading per m² is reduced. Due to the high cost of labour, deep strip foundations have largely been replaced by trench fill. Trenches are dug to a depth where the subsoil provides sufficient load-bearing capacity, and the whole trench is filled with concrete. Steel reinforcement may be added in areas close to trees. 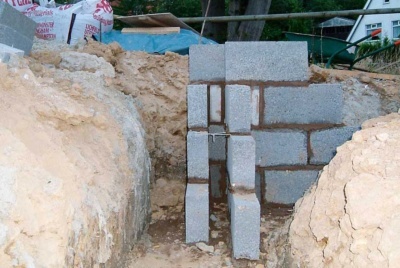 Compared to deep strip foundations, trench fill minimises the width of the dig and the labour and materials required for building masonry below ground level, offsetting the cost of the additional concrete. A reinforced concrete raft or mat is used on very weak or expansive soils such as clays or peat. They allow the building to ‘float’ on or in the soil. 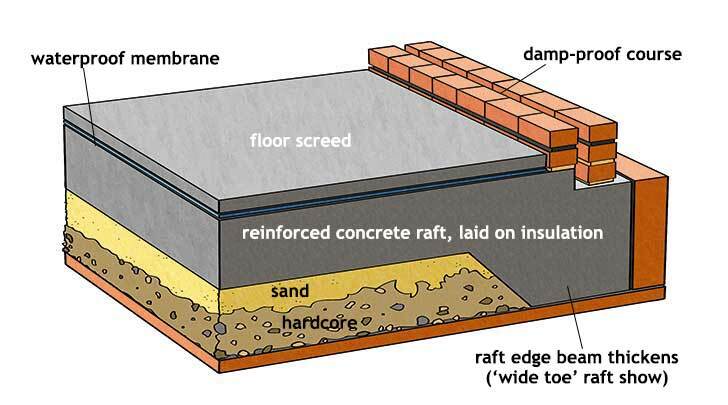 A raft is used where the soil requires such a large bearing area that wide strip foundations are spread too far, making it more economical to pour one large reinforced concrete slab. 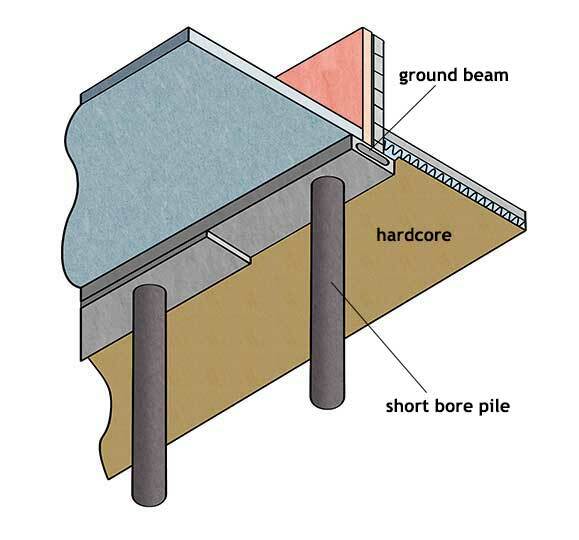 Short bore pile and beam: Where the ground conditions will not support strip foundations and the depth of trench fill foundations become uneconomic, or ground conditions make them unsuitable, a series of columns (piles) can be bored and cast in-situ, or precast piles driven into place until they reach stronger strata. Short bore piles are typically 2–3m long and can be reinforced with steel. Each pile is then connected at the top by a precast horizontal beam of reinforced concrete. A suspended reinforced concrete ground floor can then be built using precast components, or cast in situ. Friction Piles: A similar concept to short bore pile and beam used in situations where there is no suitable bearing stratum at an acceptable depth. Friction piles rely on skin resistance against the soil. Used when isolated loads need to be supported, for instance to support the columns of a steel or post and beam frame house. The load is concentrated on a small area. 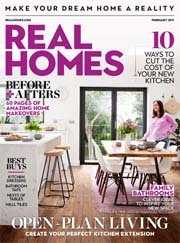 I am a Structural Engineer, and I am shocked by how ill-informed your article on foundations is… It beg’s belief that you are supposidely providing an element of ‘professional’ advice to self builder’s, when you clearly have no clue yourself…. 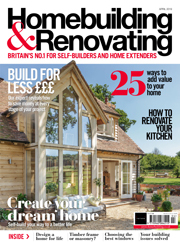 Incredible..
Hi – interested to hear your views on this – if you would like to let us know your issues with this article please do drop me a line at homebuilding@centaur.co.uk. 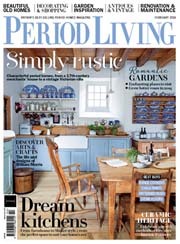 The articles are prepared by experts in their field and I would be keen to hear if there is any way we can improve on any of them. Why would anyone build a foundation with 4" solid blocks? Sort of defeats the purpose. 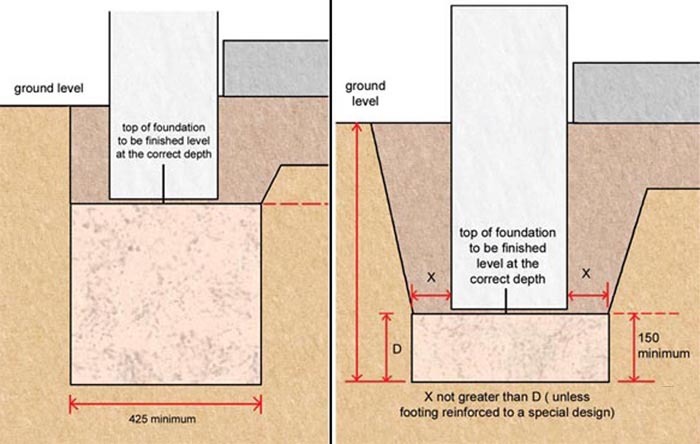 I note the information relating to Types of Foundations does not include foundations to terraced properties which are constructed on rock and concrete (ratio of 50/50) foundations to front elevations. I note that our property is constructed on solid rock with concrete foundations with debris in part of the concrete section with a bed of Clinker? beneath.Is this or was this common practice during the construction period circa 1955. I was wondering if you know as I do have problems with cracking as do the other four out of five properties on the terrace exhibiting the same cracking to the non cavity party walls? If you need more info please ask. A plot I am intersted in is impacted partly by tree root protection areas. This is only going to be along one side of a 200 sq.m. footprint. The arboriculturist has indicated piling will be required to protect the tree roots. The question is; can I use normal trench foundations for three sides and internals, where there are no protected areas and piling where necessary. Is it possible or indeed good practice to mate the two methods? I also work as a structural engineer and I agree with the previous comment, the info given is either quite vague, misleading or incorrect. 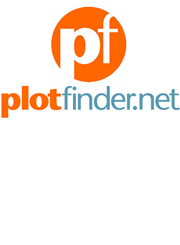 We are always keen to improve upon an article which may be deemed misleading.